From left: Nikolas Briggs and Melody Uhler. When Briggs Uhler was about three his mother Melody noticed he seemed to be ignoring her or asking her to repeat things. It was enough for her to suspect something could be wrong. 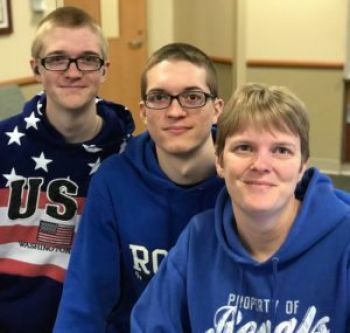 Melody Uhler said she knows of no such hearing issues on either side of the family and has no absolute explanation for why hearing loss affected both of her sons. “It’s hard to find out anything is wrong with your child” she recalls. Thanks to early diagnosis and regular treatment and hearing aid fittings Briggs and Nikolas have grown up to be active teens who don’t think much about it. In fact when Nikolas was little and before his diagnosis she remembers him asking when he’d get his hearing aids like his big brother. The boys have been in the care of Amber Wolsiefer Au. D. audiologist with Reid Hearing Center in Richmond for the past four years. They found her after Dusty Uhler’s job brought them from Ohio to Indiana. At first they had their follow-up visits in Indianapolis until they connected with Dr. Wolsiefer who specializes in pediatric audiology. Younger children may be given blocks or toys to put in a bucket each time they hear a beep for example. Infants and younger children can be tested while sleeping she said. “The sooner we treat hearing loss the better a child will be not only in terms of hearing but also in terms of developing speech and language.” — Amber Wolsiefer Au.D. About 1.5 out of every 1000 newborns has a hearing loss she said. Genetic losses make up about half of all hearing loss issues in childhood.